Oklahoma City is located along the North Canadian River, a frequently nearly–dry stream, at the geographic center of the state. It is not quite 1,000 miles south of the Canadian Border and a little less than 500 miles north of the Gulf of Mexico. The surrounding country is gently rolling with the nearest hills or low mountains, the Arbuckles, 80 miles south. The elevation ranges around 1,250 feet above sea level. 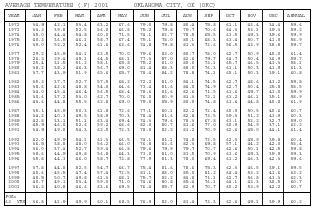 Although some influence is exerted at times by warm, moist air currents from the Gulf of Mexico, the climate of Oklahoma City falls mainly under continental controls characteristic of the Great Plains Region. The continental effect produces pronounced daily and seasonal temperature changes and considerable variation in seasonal and annual precipitation. Summers are long and usually hot. Winters are comparatively mild and short. 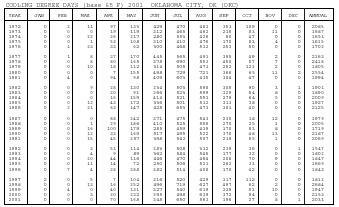 During the year, temperatures of 100 degrees or more occur on an average of 10 days, but have occurred on as many as 50 days or more. While summers are usually hot, the discomforting effect of extreme heat is considerably mitigated by low humidity and the prevalence of a moderate southerly breeze. Approximately one winter in three has temperatures of zero or lower. The length of the growing season varies from 180 to 251 days. 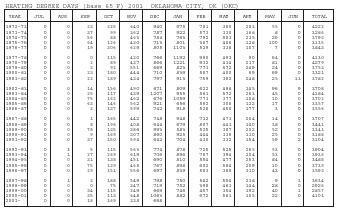 Average date of last freeze is early April and average date of first freeze is early November. Freezes have occurred in early October. During an average year, skies are clear approximately 40 percent of the time, partly cloudy 25 percent, and cloudy 35 percent of the time. The city is almost smoke–free as a result of favorable atmospheric conditions and the almost exclusive use of natural gas for heating. Flying conditions are generally very good with flight by visual flight rules possible about 96 percent of the time. Summer rainfall comes mainly from showers and thunderstorms. Winter precipitation is generally associated with frontal passages. 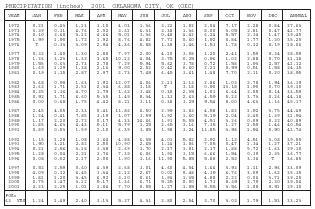 Measurable precipitation has occurred on as many as 122 days and as few as 55 days during the year. 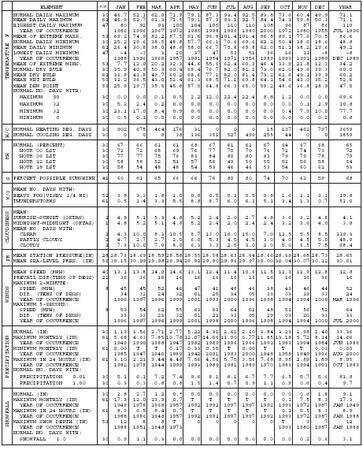 The seasonal distribution of precipitation is normally 12 percent in winter, 34 percent in spring, 30 percent in summer, and 24 percent in fall. 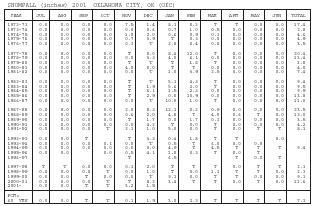 The The period with the least number of days with precipitation is November through January, and the month with the most rainy days is May. Thunderstorms occur most often in late spring and early summer. Large hail and/or destructive winds on occasion accompany these thunderstorms. Snowfall averages less than 10 inches per year and seldom remains on the ground very long. Occasional brief periods of freezing rain and sleet storms occur. Heavy fogs are infrequent. Prevailing winds are southerly except in January and February when northerly breezes predominate. Your westibe has to be the electronic Swiss army knife for this topic.